Find a therapist in Alabama with GoodTherapy.org. In 2015, the United States Census Bureau estimated that the population of the state of Alabama was approximately 4.9 million people. The Bureau of Labor Statistics reports, of this total, roughly 17,500 individuals worked in community and social service fields. This field includes substance abuse counselors, social workers, marriage and family therapists, clergy, and correctional treatment specialists, in addition to several other related community and social service jobs. Each year, Mental Health America (MHA) conducts a nationwide survey—titled The State of Mental Health in America—to evaluate mental health conditions and practices across the country. The state of Alabama received an overall ranking of 31st out of all 50 states and the District of Columbia in the 2016 edition of this survey. Alabama was ranked 9th in prevalence of mental health issues—indicating a relatively low prevalence of substance dependence and mental health conditions. Factors that may have contributed to these circumstances include low rates of homelessness, low rates of child maltreatment, and high rates of high school graduation for disabled individuals in the state. Alabama was 13th in overall adult ranking, with a lower percentage of men and women reporting abuse of drugs and alcohol as well as serious thoughts of suicide in comparison to other states. 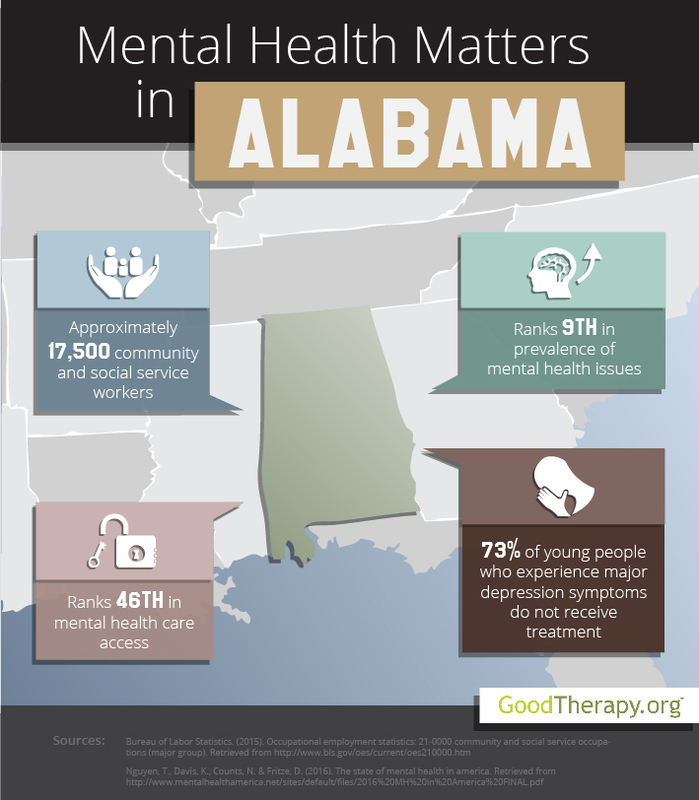 Despite these statistics, there are several distinct issues researchers and therapists in Alabama may need to address. The 2016 MHA survey listed Alabama in 46th position in the category of access to care, which suggests that residents with mental health concerns may have limited access to the professional care they may require. Certain social factors such as high rates of unemployment, poverty, and obesity may restrict a person’s ability to utilize the residential treatment centers, drug rehabilitation centers, and other mental health resources available within the state. Additionally, approximately 22.6% of adults with mental health issues in Alabama are currently uninsured. A second area of concern is the state of mental health among young people in Alabama. According to the 2016 MHA survey, Alabama is 39th in overall youth ranking. While the data suggests that a relatively low percentage of young people in Alabama experience severe depression symptoms or depressive episodes, 72.5% of young people who do show symptoms of major depression do not receive any mental health service. Many clinical studies have highlighted the positive impact therapy may have on lives of individuals with depression. Treatment options such as group therapy, individual therapy, and family therapy have may be beneficial for many people in professional care. Nevertheless, parents must be selective as they seek to find a therapist in Alabama who is able to address the specific needs of their child.